Particulate matter (PM) has a diameter of or below 10 microns and is referred to as PM10. Dust particles with a diameter of less than 2.5 microns are referred to as PM 2.5 or PM 1 for particles below 1 micrometer. Particulate matter comes from multiple sources, and is generated during the combustion of fossil fuels and wood. Fine dust is also generated by abrasion and by airborne dust. Other emissions, such as from agricultural sources (sulfur oxides, ammonia, nitrogen oxides and volatile organic compounds-VOC) also impact human health. 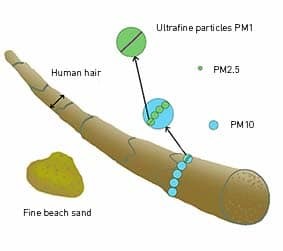 The control of particulate matter pollution is of considerable importance in the protection of human health: PM10 fine dust particles are able to enter the bronchial tubes and finer particles may migrate unhindered into the deepest airways all the way into the blood stream. This particulate matter causes inflammatory reactions of the respiratory tract, which can lead to serious health problems such as COPD, bronchitis, lung cancer but also strokes and circulatory problems. For this reason we recommend the installation of an electrostatic particle separator on chimneys or in boiler rooms to protect your health. Why is the installation of an electrostatic precipitator recommended? The installation of an electrostatic precipitator for wood stoves, such as the OekoTube, is recommended to drastically reduce the emissions of PM10 or smaller, ultimately for the protection of human health. In many cases air emissions from point sources are regulated and must therefore be reduced. Electrostatic particle separators from OekoSolve have been proven to be highly effective in the removal of these micro dust particles. How much do electrostatic precipitators cost? The cost of the individual devices is determined by their intended performance, accessibility, any necessary modifications and the type of heating system used. Please do not hesitate to contact our team to request a free offer. Where is the production site? The headquarters and the production site are located in northeastern Switzerland (Mels).